If treasure there be on Oak Island in Mahone Bay it has already exacted a tragic toll among those who have sought to dig it up. For more than 200 years treasure seekers have sunk millions of dollars into a futile quest for riches that may not even be there. Some have paid an even higher price; falls, flooding, and other accidents have claimed the lives of six people. Is it pirate gold or something else? The yarn starts in 1795 when 18-year-old Daniel McGinnis said he saw lights coming from the island. In daylight, he and a couple of friends went to investigate and found a circular depression in a clearing with a block and tackle dangling from an overhanging branch (there’s some doubt about the lifting gear). Local legend had it that pirates were in the habit of burying their ill-gotten gains on some of the more than 300 islands in Mahone Bay. Indeed, the dastardly Captain William Kidd admitted to burying some of his riches before he was captured in 1699 and hanged two years later. Also, the terror-of-the-high seas, Blackbeard, is said to have confessed to concealing his bounty underground. Other stories have it that the Knights Templar hid a golden trove on Oak Island, or it might be the lost French crown jewels that once adorned Marie Antoinette. They found a layer of flagstones a couple of feet below the surface. They continued digging until they hit logs at ten feet, at 20 feet, and again at 30 feet. That’s when they gave up. A company took over and went down a further 60 feet, finding logs every ten feet as well as coconut fibre, charcoal, and putty. Then the shaft flooded and they gave up. By the mid-1800s this hole in the ground that had produced nothing but dirt and logs was known as the “Money Pit.” Perhaps, this is a reference to what was thrown into the pit rather than what has yet to be taken out of it. Investors were herded together to form The Truro Company in 1849. The hopeful backers were, no doubt, spurred on by the story of a flat stone tablet (left). It was supposedly discovered in the pit and bore curious symbols. The Truro Company found exactly what the previous excavation had found – water, and lots of it. But this group of treasure hunters started drilling through the bottom of the flooded shaft. They claimed to find a spruce platform under which was a foot of empty space, then some “metal in pieces,” oak, more metal, oak again, more spruce, and then clay. What could these layers mean? 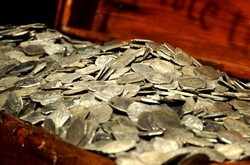 Predisposed to find treasure, the Truro Company decided they had drilled through a couple of chests filled with coins. To overcome the flooding problem they decided to dig a parallel shaft and punch through to the booty. But, water began to rush in to the new hole as they connected with the Money Pit. Then someone noticed that several channels had been dug from a nearby beach to the original hole, and they had been carefully camouflaged; their purpose was to flood the pit with sea water. Various attempts were made to overcome the surge of water but they all failed. The Truro Company had had enough. A dig in 1861 discovered a cavern which was enthusiastically interpreted to be a booby trap set to thwart anybody looking for the bullion. By the turn of the century, the Money Pit had claimed its first two victims; one was killed when a pumping engine boiler exploded and the other fell into the shaft. Franklin D. Roosevelt (third from right) put up some money to finance an Oak Island expedition, but it came away empty. He kept up his interest in Oak Island, although not financially, well into his presidency. Nobody knows what this might mean. Bob Restall began yet another attempt to crack the mystery in 1959. While excavating in 1965, Restall passed out and fell to the bottom of a flooded shaft. His son and two workers went to the rescue but they too became unconscious and drowned. The cause was probably carbon monoxide from a generator. Since 1965, Dan Blankenship has owned a chunk of Oak Island and has spent almost a half century looking for what somebody seems to have gone to a great deal of trouble to conceal. Blankenship and his crew claimed to have made a puzzling find in 1971. They lowered a metal tube with a camera into the ground about 200 feet away from the Money Pit. The camera emerged into a flooded chamber and the team say they saw three chests, a severed human hand, a pickaxe handle, and what was left of a human body. Divers, including Blankenship, went down but they ran into a powerful current and had to call off the search. Later, the shaft collapsed almost killing Blankenship. Dan Blankenship’s son David continues the search. The show gives ominous advice for anyone bitten by Oak Island treasure fever: there’s a legend that the treasure will not be found until seven people have died looking for it. So far, there have been six fatalities. It’s the thought of pirate gold that drives everyone on, but there’s yet to be evidence of such, just tantalizing clues. There’s no shortage of other theories. One implausible guess is that the tunnels contain Elizabethan manuscripts proving that the plays attributed to William Shakespeare were, in fact, written by Francis Bacon. Of course, the claim that it was a UFO base was bound to crop up. Some advocates of this hypothesis say the shaft and tunnel system was designed by none other than Leonardo da Vinci. Sukhwant Singh of Tulsa, Oklahoma says the whole thing smacks of the Vikings. He believes a beached long ship got turned vertical by climate changes and plunged into a sinkhole and that the wood found in the pit is nothing more than the vessel's timbers. Then, there’s the practical joke notion. If it’s just a prank it’s one of monumental complexity that has clearly outlived its creator. And, those looking for a cache of Spanish doubloons would no doubt view such a hoax as a very sick joke. “Curse of Oak Island Reignites Centuries-old Treasure Hunt.” CBC News, February 11, 2014. “Treasure Hunt to Discover Oak Island’s Mysterious Booty.” Nina Strochlic, The Daily Beast, February 27, 2014. “Dispelling the Legend.” Robert Hirtle, South Shore Now, January 7, 2014. I did read that the pit descends to a series of submarine valleys that were last exposed when sea levels were much lower than they are now. If true, this makes the pit very old. But the state of the pit and the preserved remains suggest that it is younger than that. Knights Templar did not, as far as we know,use runes. There is something strange about Oak Island, as the shafts seem to descend far below sea level, and could it seems have been dug prior to sea levels rising at the end of the Ice Age. I find the extent of the hole given when it was claimed to have been initially dug too much to have been done in even a few days. And to include the sea shafts would have taken much longer. The Knight's Templar theory has become popular here in recent years. It's devotees have found what they consider to be evidence of a series of stone markers and towers used to help locate the treasure. One of our little museums here is even supposed to have one of their rune stones.